I think that the more and more you listen to someone's music, the more capable you becoming in knowing what to expect from them in the future. It's very interesting that, even when dealing with people who you don't know very well and may never even meet in person in some instances, you can still approximate where they are and where they will be, musically, at any given time if you pay enough attention. Currently, when I look out across the landscape of Reggae music, I not only see artists who fall directly within this concept, but also those who fall just a bit outside of it as well. On one hand there is someone who is so wonderfully easily predicted such as Sizzla Kalonji. By this point we well know that there is no set-in-stone course to what that man does, so his work is only very simple to anticipate, because you have no idea what he is going to do. Ever. So you predict everything. More terrestrially would be someone like Luciano who can almost be guaranteed to stand up and sing righteous music whenever he gets the opportunity. 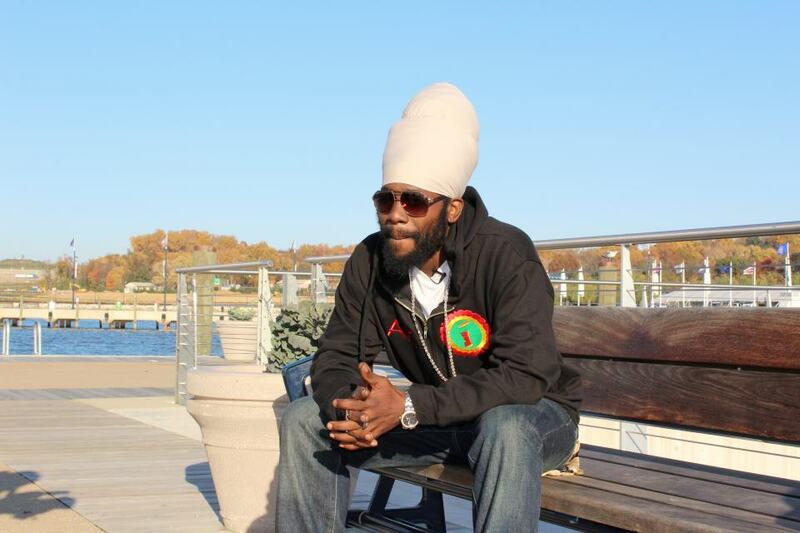 Over his legendary career, 'The Message' has established himself as one of the most dependable and stalwart artists in Reggae music and for as long as he is singing, you can be sure that will be his case. A good example of someone who 'resides' in the not as predictable, but definitely anticipated arena would be . . . Oh I don't know, maybe Ras Attitude. What you expect from him is different and you do it for a different reason as well. To my opinion, the chanter from out of St. Croix is as wholly gifted as ANYONE in Reggae music today and he also seems to perpetually be standing in waiting room of greatness and a level of stardom which is near the top of Roots Reggae. Here's how he's predictable: Having listened to so much of his work, I'm as confident RIGHT NOW as I've ever been that Attitude will 'walk in the room'. Before his career is done, I'm 99.9999999999% sure Attitude will be one of the biggest names in the game and my confidence in that comes strictly for a musical reason. His music is just too good and his 'star potential' is just too obvious for him not be there one day. And recently we dealt with Mark Wonder for his beautiful new set, "Working Wonders" which, to my opinion was the culmination of an unstoppable amount of momentum. That isn't the specific case with Ras Attitude. He is the momentum. But of course you still have to the work, until we get there and that's never been a problem with this artist (or Mark Wonder, thankfully). It's been now three years from since Attitude has jumped out with a big album for the masses. His last release, 2009's "I-Meditation", was his finest and was the premise of this review in a microcosm. It was a shuffle (in any direction, any one at all) away from being this kind - LOOK HERE - type of a moment for him and it was only that far away because you could still hear that he could do better and, again, he would (and he still will, I'm sure). To my ears, it was the finest of his six album catalog at the time and while I could point to other big moments for him ["Ithiopia alone! Ithiopia alone! "], were you to ask me which of his full projects best showed Attitude in the finest light, I'd hand you a copy of "I-Meditation" (and then take it back immediately and tell you to get your own) (do I look like a store???). Moving forward. I'd like to think that the extremely well received last album brought in just a bit of new fans who would stick around and anticipate the next piece of work from Attitude and now I'm going to get an opportunity to test that thought - kind of. 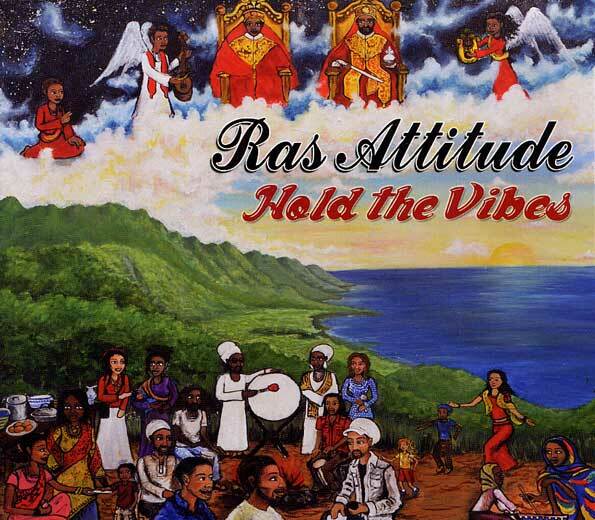 Ras Attitude now brings forth his latest creation, "Hold the Vibes". There is SO little that I can tell you for certainty about this album that there is SO much that I can tell you about (that makes no sense at all, but it's accurate). The album comes via one Leslie Carlton and OneDrop Productions, which is apparently a very new label from out of California. However, there're two things about this one which standout behind the scenes. The first is that we found a poster/picture announcing its arrival (with the label's name on it) which was dated back to nearly a year and a half ago (April 2011). Secondly, and far more importantly, "Hold the Vibes" carries the insignia of Sound V.I.Zion Records which just adds a completely separate division (did you catch that?) of interest here. Sound V.I.Zion is not only the label which brought Attitude to prominence in releasing both of his first two albums, "Happiness" and "Love Life" (which I've been listening to a lot these days), but it's also the label of his very good friend, musical family and all around genius craftsmen of vibes (who needs his own new album), Ras Batch (who also features on a big new single from Attitude, 'Vampire Slayer' which I've told you about twice now and you should already have picked up). The guess here would be that this album is the product of some type of collaborative effort between the two labels which have apparently worked very hard to bring it to fruition. OneDrop has also done something which is terribly interesting that I hope to tell you about soon (again), in releasing another album at the same time which I promised myself that I wouldn't mention by name, so what you have here is one of the best ways for a label to introduce itself in recent memory. Now, also something that should be mentioned is that this piece just . . . Kind of seemed to pop up from out of nowhere late last week and here it is. We've been talking a great deal of promotion lately, and promotion especially regarding artists from out of the Virgin Islands, in light of Midnite's continued pilgrimage following their glowingly pushed 2011 set, "King's Bell". This album will certainly get more of a push than it has already (HOPEFULLY) and it will be very interesting to see how it is ultimately supported. While that remains to be seen, what we can take a look and listen to right now is whether "Hold the Vibes" is any good and another vivid display of Attitude's most brilliant of talents. Follow me! What I immediately noticed about the actual music on "Hold the Vibes" was that, in many cases, it's very loose and kind of free-flowing. Ras Attitude has several different styles and approaches to his work, so although I may very well be predicting an inevitable greatness from him (and I am), from album to album and from tune to tune, you don't know what to expect, although I also wouldn't call him as 'shocking' as the aforementioned Sizzla Kalonji and the likes. For an example of just how 'liberated' this set can be, take a listen to its opener, 'Soljah'. Outside of the chorus and maybe the earliest portions of the track, I'd assume that this tune was a free-style over a basic, but HEAVY, drum backing. Of course that doesn't mean that it's bad in sense -- by its end, the intro-like track proves damn impressive for what it is. Things continue with the strong next tune which is sure to be a highlight here for fans, the vibrant 'Give Thanks'. Again, I don't think that certain portions of this tune were so heavily concentrated upon when they were being written and instead the real point of interest of 'Give Thanks' is the passion Attitude throws into it. As it goes along you can hear him getting more and more focused and centered on doing what the title says to and in the latter stages of this song, he's giving thanks and praise to EVERYTHING he holds in dear in life. Not to be missed! The third tune on "Hold the Vibes" and the final of the opening batch (biggup Batch) is also the first of its two combination songs, 'We Got the Handle'. I haven't heard so much as a verse from the FLAMING Ancient King and when I heard a clip of this tune (before seeing its label), the part I heard was on him and I was very happily surprised to see him back and rhyming and this time in a heavy way (as is his usual). Free-flowing tunes are the King's specialty and he SHINES on this track which is one of the album's finest. Wonda, what is on their brain?! Attitude also does more than hold his own (the second stanza above is his alone) and we get one THUMPING combination. Definitely hope to see and hear Ancient King more active and maybe he can get us a third album in the second half of the year. The second combination on "Hold the Vibes", 'Trouble Inna Yard', is something to behold, on paper, even before you get to the actual music. The tune is a social commentary which links Ras Attitude with another man of the moment (more on him later in the week, hopefully), Lutan Fyah. I believe this is their second tune together, following the WICKED vegan anthem, 'No Bones, No Blood' (with Jah Sun) and it's another memorable moment. Ras Attitude & Lutan Fyah on a single track is CLASS and it's impacting music, 'Trouble Inna Yard' is both of those and a bit more. Obviously, someone at Sound V.I.Zion and/or OneDrop Productions wants you to focus heavily on the inspiring 'Know and See' because it's on the album in two versions -- an original and a Nyabinghi Version as well. The second of the two (which actually is the album's closer), is the better of the pair, although both are strong. The song is one mainly speaking to the youths to be aware of their surroundings and to really stay on course and focus on His Majesty. It's direction, SLIGHTLY reminds me of the brilliant 'Know Who Is Jah' from the "Royal Lionage" album. Not quite on those levels, but if you hear the tune, you can tell that it likely came from the same type of idea. Your attentions will also, at some point, steer in the direction of the title track, which is another piece that is so fluid. There's not really a set pattern here, it almost seems like a singing speech of sorts, with Attitude just paying a necessary amount of respect to the music itself. Similarly, check 'Remembrance', which would probably think was a tribute to someone who had transitioned, but instead, it is an ode to sweet times gone by (and it also features more singing from Ras Attitude who deos, whether you know it or not [! ], have a fine singing voice when he chooses to use it). One of my personal favourite songs on "Hold the Vibes" is one which I've already convinced myself won't be widely appreciated and kind of looked over in the way of far more immediate material here. YOU don't do that though! Take an extra special listen to the track 'Calling'. It's a big selection and not just a big one for THIS album. It would absolutely stand favourably on anything I've heard from Attitude to date. Still, the best song here to my ears is the curiously GORGEOUS 'Here We Go'. There's something about merging a sweet vibe with a SCATHING critique which gets my attention and I LOVED it on this call to action from Ras Attitude. It's a sparkling song with a deceptively HARSH message aimed at those who stand against righteousness. Not too far behind 'Calling' and 'Here We Go' are another triumphant pair of compositions, 'Always' and the later 'Pray For Me'. The former is GOLD and it makes a point that I'll get back to in just a second with the music there being SO nice. It speaks on people who, no matter what you do, just CANNOT be happy for you "always" attempt to go out of their way and tear down your happiness. 'Pray For Me' is even better in my opinion. Here, the chanter is acknowledging that his path in his life is his own to take and make ["don't cry for me, my pain ain't no different from yours"], but if you wanted to help him out in anyway - throw up a word to His Majesty (and I'm sure he wouldn't mind if you purchased his new album as well) (if you REALLY wanted to help a little). Of the three remaining pieces on "Hold the Vibes", the definitive highlight is 'Miss Royalness'. Had you asked me on the first listen of this tune, I would have told you one thing and one thing only, 'the riddim is AMAZING', but now, fifteen spins on or so, it's well grown on me. And there's also the obligatory herbalist track 'Hi-Grade' which is decent, but infectious (so be careful) and finally the perplexing 'Do Re Mi', which is the only track on the album which I didn't like very much. It certainly isn't a bad tune, but again, it's almost surely a freestyle of some sorts because it goes in about forty different directions before it runs its course. Overall, there're more than enough good moments to make up for any soft spot you'll find on "Hold the Vibes" (and you won't find many). There is something I alluded earlier that earlier that should come up in closing: The MUSIC throughout this album is fantastic. 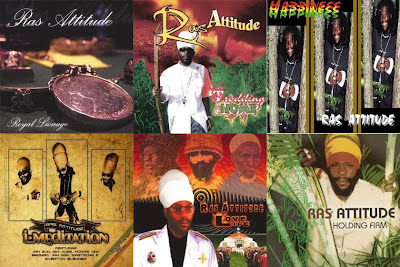 The questions would be on 'Do Re Mi' and 'Hi-Grade', but everything else is straight forward Roots Reggae brilliance, especially that cascading Arabian vibed track standing behind 'Miss Royalness'. All of that is a sign that points to Ras Batch (if he did do the work, if he didn't the big respect goes to Leslie Carlton and company), he simply does not make bad music. 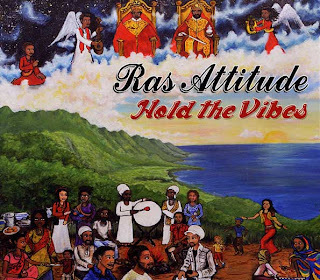 The prevailing quality of "Hold the Vibes" indicates just as firmly the work of Ras Attitude. As I said, the man is still on course and on pace to do something TRULY (biggup Lutan Fyah) special and I'm beginning to think more and more that it will be a big and profound album. That moment doesn't quite come on "Hold the Vibes", but it does nothing but make me think that my forecast of his greatness is still on schedule.